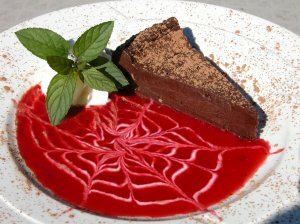 If you find yourself at The Brentwood in Little River, S.C., you are certainly in for not only a lovely meal, but also a decadent dessert. From New York style Cheesecake to the classic French Crème Brulee, there is truly something for everything. During my last visit, Chef Eric Masson dreamed up a little masterpiece: chocolate mousse with raspberry sorbet. This flavor combination was the perfect end to our meal. It was rich while at the same time refreshing, indulging while simultaneously stimulating. So save some room and grab a spoon!